It was a very elegant and spacious older home, with one big flaw: a small galley kitchen. Not something an owner who likes to bake and cook wants to live with, especially when it’s in a large home. Gail and her husband Jim are the owners of Drury Design in Glen Ellyn, Ill., a suburb of Chicago. Jim mostly handles management and marketing, while Gail is the lead designer, with 30 years of design experience and expertise. She’s been a design instructor for the Kitchen & Bath Association, and holds the industry’s highest professional certification: certified master kitchen and bath designer (CMKBD). 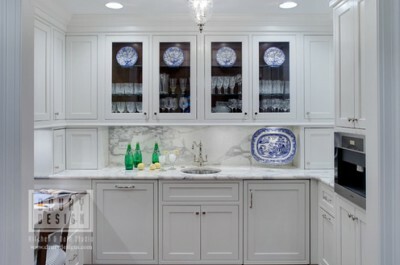 The kitchen project for this Hinsdale, Illinois kitchen remodel is typical in scope to many high-end projects she tackles with Grabill Cabinets. Gail said there was considerable back-and-forth discussion with the client over a long wish list, including professional appliances, a computer area and a coffee bar, along with a more stylish look and an upgrade in functionality for an active family with three young children. 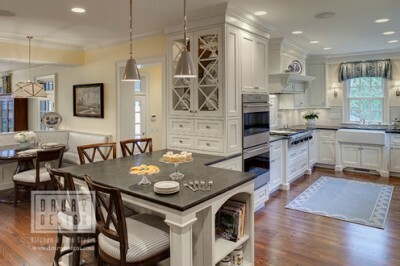 Gail settled on a design that incorporated nearby hallway space into a more expansive and multifunctional kitchen area. This included closing off a pantry entrance to create a space that contained a butler’s pantry in the middle and a computer area on one side and a coffee bar on the other. The original eating area was moved to another corner of the hallway space and reconfigured as a built-in banquette matching the kitchen cabinetry. This left more space for the working part of the kitchen. A snack bar extending out into the hallway was added to the working area. An additional cabinet with mullion doors was added to the snack bar corner, both creating a central focal point for the expanded kitchen area. This effect and various style elements helped tie the whole space together. The style for the columns used in the kitchen by the sink and snack bar were inspired by the millwork in other areas of the home. One wall of walnut stained pantry cabinets added an accent piece, and the walnut was also used for the computer area countertop and the backs of the glass door cabinets, further unifying the expanded area. The inset cabinet doors were an “elegant cottage” look. Black soapstone countertops for the kitchen and a Calcutta marble counter for the butler’s pantry added formality and elegance that blended well with the home’s style. 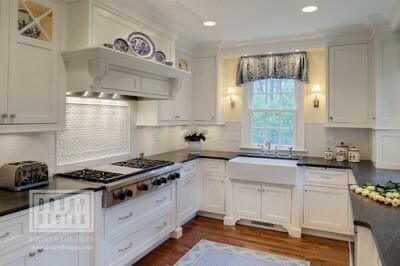 For the working kitchen, the main goal was “more space and up-to-date appliances,” including a double oven, said Gail. Moving the range from one side to the other created more extended counter space for baking. And “tons of cabinet space” was added. Grabill was great at helping with her custom needs for the project, said Gail, including custom table legs that she designed. So how did the client like the results? “She was amazed at how much better the space functioned. She loved the new multipurpose coffee bar/butler’s pantry. It made entertaining so much easier,” said Gail.